After trialing last summer, it was clear that we needed to add this variety of 4 O'Clocks to our list. But…where to put them? The plants have either lime green or green foliage on a very well-branched compact plant. A much tighter and erect form than our border gem varieties. The blossoms are doubles in 2 colors. 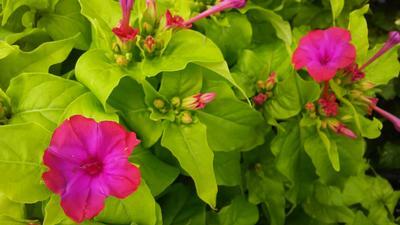 We would recommend this for both foliage alone or as a blooming accent to container or the garden.